A Cooking Bookworm: It's FRIDAY! That means, FREE CHOCOLATE!! Yep, that's right!! 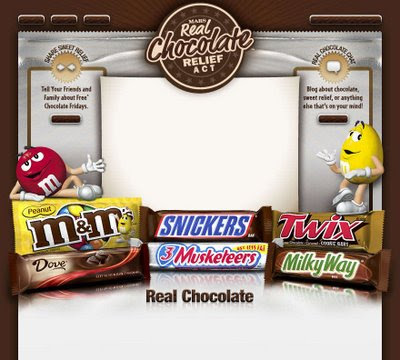 Every Friday, beginning at 9 AM, you can visit Real Chocolate and enter your email address to receive a coupon for FREE CHOCOLATE!! You can receive up to 4 coupons per household - you just need separate email addresses. We've already gotten all four of ours! How did you get the SwagBucks Swidget to show only your first name? Mine shows my first name and last initial, and I don't know where to change it. Stopping by from sits to say hi because you commented above me!